If you don’t know what a TED talk is, or you don’t know the difference between TED and TEDx, please start by reading my TED post from last November. Okay, you’re back. Good! I’ve been asked a lot of questions about TEDxBozeman and my talk, and now that it’s over and I have decompressed a bit, I will be happy to answer them. I’ll start by saying that (A) the talk should be on TED.com and YouTube by April 21, (B) yes, my talk will be captioned, and (C) I will post more detail about the talk itself in the next few weeks. Most of the questions, though, were about the event itself. How does this all work? What goes into a TEDx event? On stage at TEDxBozeman 2014. That nine minutes on stage is the culmination of months of work for me, and the process started much earlier than that for the team that put on the event. For me, it began last October when Ken Fichtler, the co-founder of TEDxBozeman, stopped by my tea bar. I wasn’t there, but he left me a note suggesting that I apply to be a presenter. Obviously, I leaped on the opportunity. On November 19, a few nail-biting weeks after I submitted my application, the selection committee sent an email saying they’d chosen me as one of their speakers. At that point, I officially committed to do something I’d never done: memorize a speech. I’ve done a lot of public speaking, ranging from educational seminars to emceeing live events. In every single instance, I’ve had notes. I’m good at following an outline. My speaking style, however, is like my father’s. He always said that a successful speaker or storyteller needs to be constantly reading the audience and adjusting the speech, and that’s what I learned to do. My notes keep me on track and I improvise the words. That isn’t the way things work in TED talks. At 15 minutes, the talk was too long. I had too many facts and figures. One reviewer actually said I sounded too much like a textbook or a Wikipedia page. Ouch. I did write the textbook on the subject, but that’s most emphatically not what my talk was supposed to sound like. I went to work on cutting and restructuring the talk. And just as I felt good about it, the rug was pulled out from under me. The FCC unanimously voted to implement new quality standards for captioning. I had one weekend to rip out my entire lecture about why the FCC should be doing this and instead focus on what they were doing. I was using the word “quality” to talk about captions here. I could just as easily have been talking about the staff that put this event on. They were an amazing group! I arrived in Bozeman two days before the event. I’d like to think I don’t need much handling, but my handler certainly was helpful in making sure I was in the right places at the right times. I should note at this point that TEDxBozeman is put on entirely by volunteers. Dozens of people donated their time to do staging, sound, video, check-in, decoration, and more. Even our handlers were volunteers. Yes, we had handlers! The TEDx speakers are not paid for this. We volunteered our time as well. They did, however, provide hotel rooms for those of us coming in from out of town, and fed us a couple of times as well. That was much appreciated. 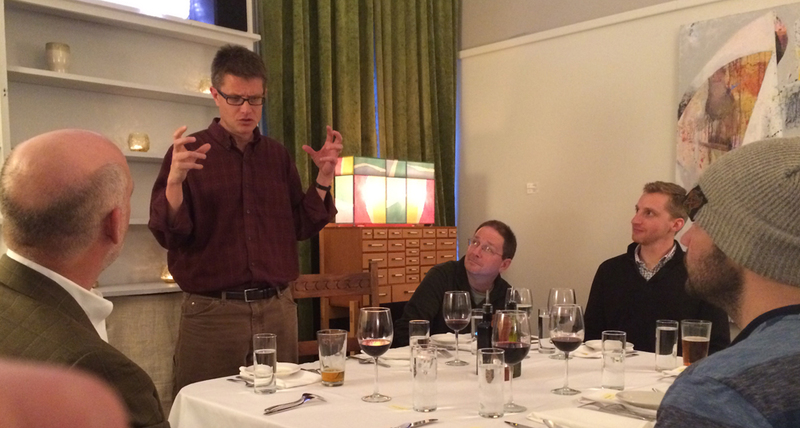 Wednesday night was a presenter dinner. We all had an opportunity to meet each other — I had talked to everyone on video chat, but we hadn’t met face-to-face — and to meet the organizers. The lineup of speakers for TEDxBozeman 2014 was downright intimidating. At one point, I was talking with several of them and realized I was the only one in the group without a Ph.D. I felt like Wolowitz on the Big Bang Theory, but at least he has a Masters degree. I don’t even have that! On the other hand, many of them were speaking about subjects that really interested me. Mary Schweitzer’s talk about paleontology and studying dinosaur proteins. Rebecca Watters’ talk about wolverines. Molly Cross’ talk about climate change. We were seated at three tables, so I didn’t get a chance to talk with everyone, but I sure liked what I was hearing. Our emcee, Paul Anderson, describes the ritual dismemberment of speakers who forget their lines. Actually, he was telling a joke, but it sure looks like he was talking about ritual dismemberment. The organizers then gave us a little pep talk. It helped that Paul Anderson, the emcee, had done a TEDxBozeman talk himself a couple of years ago, so he was able to tell us what to expect. After dinner, I headed back to the hotel and rehearsed a few more times in front of the mirror. Thursday was dress rehearsal day, and I got my first glimpse of the venue. Wow! The decorations and sets weren’t fully assembled yet, but I could already tell it was going to look great. For the first time, we got miked up and climbed up on stage to do a live run-through. I watched the person before me do her talk, but I didn’t really see it. This was all starting to sink in. I started the dress rehearsal by getting about 30 seconds into the talk and having my video not work. We took a break and they figured everything out. We started again, and I must have gotten out two whole sentences before my mind went completely and utterly blank. I just stood there. The third time was a charm, however, and we made it all the way through. Then the lighting guys came up and said that my hat was going to be an issue. It cast a shadow over my eyes. The speaker coordinator, Maddie Cebuhar, said maybe I just shouldn’t wear it. Three people said, “Oh, no. He has to wear that hat. We’ll make this work.” What we ended up deciding was that I’d tilt the hat back, and then pay attention on stage. If the lights weren’t in my eyes, I had to lift my head or tilt the hat more. They really should expect that if they have pieces of the set laying around, someone like me will pick them up and play with them. That thing’s metal, by the way. It’s quite heavy. Then I sat there thinking about how I’d cover if the video equipment caught fire. Then I called my wife. She talked me down and told me to go clear my head, so I went to the Museum of the Rockies, where I ended up seeing an exhibit about a dinosaur dig one of the presenters worked on. Cool! I also went to the show at the planetarium. I read a book for a while, met a friend for a beer, and went back to the room to rehearse a few more times. Friday. The big day. We had a speaker room where they fed us burritos (Yay! Beans for the presenters!) and gave us the big pre-show pep talk. I walked into the room where we’d rehearsed the day before. The sets were done. The stage was together. The cameras were set up. And the crowd was filing in. A sold-out room with over 500 attendees. I have no idea how many more were watching the live stream online, or how many more will eventually watch these talks on TED.com. Our talks were divided into three sessions. I sat with my wife and daughter and watched the first set. It opened with ceremonial Native American drumming and singing by the Bobcat Singers, a TED video, and some very professional speakers that had obviously done this kind of thing a million times before (Michelle Larson and Greg Gianforte). My mind was fuzzed out by all of the adrenaline. I’ll have to watch those again because I don’t remember them. I paid attention to Mary Schweitzer’s talk because it interested me, we watched another video, and then “Basement Jazz” closed the first session with spontaneous jazz/funk improvisation. We went into the first break, and I went to do one last dry run before we started. My handler tracked me down in a dark room where I was practicing and dragged me over to the “speaker corner” so they could wire me up for sound. I wandered back into a storage room (telling him where I was going this time) and practiced some more. When our session started, I stood and watched the first speaker (Carmen McSpadden), but I really wasn’t seeing or hearing her. I was up next. Do I look calm? Because I’m not! Everyone told me later that I looked calm and cool when I presented, but I certainly didn’t feel that way at the time. All I could think of was forgetting my talk. Or the video equipment bursting into flame. This is where a hundred practice runs took over. I got through the first few minutes, realized it was all flowing, and just let it go. The nervous energy turned into passion. Next think I knew, the talk was over and I was headed offstage. They got my microphone off and I watched the next talk: Rebecca Watters’ wolverine presentation was as fascinating as I had expected. Then, I got my mind blown. Theo Bennett is a high school senior, and he gave one of the most stirring, emotional, passionate, inspirational talks I’ve ever heard. Half of the audience was in tears. He got the only standing ovation of the day, and boy, did he deserve it. Later, I tracked down Maddie and thanked her profusely for not making me follow Theo. From that point on, I was able to relax and really watch everyone else’s talks. I hope that if you’ve read this far in my ridiculously long blog post, you’re interested enough to watch all of these when the videos are released. 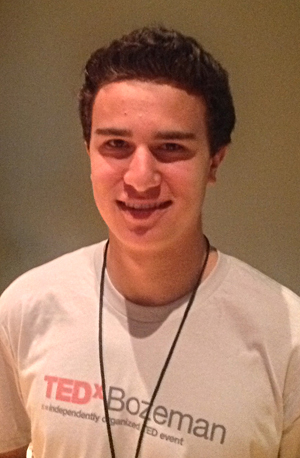 Tate Chamberlin’s “experiential remix” was unique and stirring. He told his whole story to music, and it was quite a story. I’m glad I didn’t have to follow him, either. Molly Cross has a very different point of view about climate change. It’s best summed up as “let’s take the things we can’t change and figure out how to get excited about them.” It really made me look at climate change differently. The rest of the third session, with the exception of the musical performances by Josh Powell and the Bobcat Singers, centered on technology. I want to stay in touch with Craig Beals to see how his simple “how are you?” questions to his students develop down the road. Graham Austin made me think about my store and how people connect to it. And I’ll definitely be staying in touch with Rob Irizarry about CodeMontana and teaching children about computers. By the end of the day, I was really ready for a beer. They served us a wonderful dinner, and we mixed and chatted. I went back to the hotel room, fully intending to head out to the after party (Tate told me all the cool kids would be there), but once I walked into the room I realized I was completely exhausted. By the time the after party started, I was already asleep. TEDxBozeman inspired me to push my boundaries. It introduced me to a lot of people I hope will turn into friends. It crossed an item off of my bucket list. And I think it made me a better person. TEDx Talk Details. Vague details, but details nonetheless. When I first wrote about the talk I’m giving at TEDxBozeman, there wasn’t really a lot to say about it. My application had just been accepted. The details weren’t nailed down. The lineup hadn’t been posted. Things were quite preliminary. Today, I know quite a bit more, but I’m not allowed to ruin the surprise. The TEDxBozeman website has bios for all of us, but it still doesn’t list details about our talks. We are, in fact, forbidden to publish our slides or outlines beforehand. But there are a few things I can tell you! 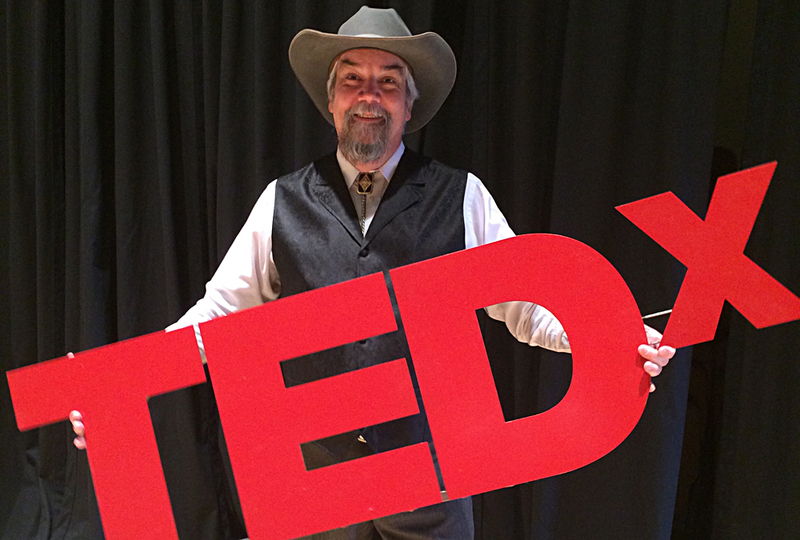 TEDxBozeman begins at 1:00 p.m. Mountain Time on Friday, March 21. If you’re connecting to the stream online, do it early. My talk will begin at approximately 2:50. If you wish to watch, I recommend connecting at least ten minutes before that, just to be safe. The title of my talk is, “Does Closed Captioning Still Serve Deaf People?” In the talk, I will briefly explore the history and development of closed captioning for deaf and hard-of-hearing people and look at where it’s heading. For more details, you’ll have to tune in and listen! My cover slide might look something like this. But then again, it might not! If you don’t have a ticket to the event and you’re unable to connect to the live stream, fear not! You’ll be able to find my talk, along with the others from TEDxBozeman, on TED.com at some point. When it’s there, I’ll make sure and post the details here. I will drop one teaser about the content. The FCC made a new ruling about captioning quality last month. It necessitated a number of changes to my talk. Well, this is a bit embarrassing. I am speaking about accessibility, and my talk will not be closed captioned live. I just couldn’t get things worked out. I promise you, however, that I will do everything in my power to make sure that when it hits TED.com and YouTube, there will be captions on it! One of my favorite independent bookstores, Country Bookshelf in Bozeman, will be selling books at the event, and each presenter was allowed to choose one book: our own if we’ve written one, or someone else’s if it inspired us. I chose The Closed Captioning Handbook (duh), but fate — and my publisher — seem to have worked against me. When The Closed Captioning Handbook became a textbook, the price shot up. The publisher, Focal Press, has made the book available through the mainstream distributors that bookstores buy from, but it is nonreturnable. This basically means that no bookstore other than a campus bookstore or specialty broadcast industry bookstore would ever stock it. Understandably, Country Bookshelf doesn’t want the possibility of ending up stuck with a stack of unsold $75.00 textbooks after the event. Never one to give up an opportunity, I came up with an alternative. If we can’t have my primary closed captioning book for sale at the event, we’ll use one of my other books. 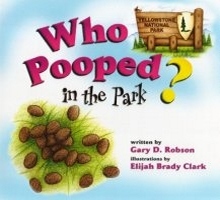 And so, my friends, even though I’ll be talking about closed captioning, the Gary Robson book at TEDxBozeman will be the Yellowstone National Park edition of Who Pooped in the Park?, because poop books are always appropriate, right? If you do wish to buy a copy of The Closed Captioning Handbook, Country Bookshelf can order one for you. If you don’t live near Bozeman and won’t be attending the event, you can order one from my store, Red Lodge Books & Tea. If you buy a Who Pooped book at the event, catch me afterward and I’ll be happy to sign it. My bucket list is an eclectic — and rather lengthy — collection of things. I’ve crossed some cool stuff off of that list: competing in a rodeo, being profiled in Forbes magazine, playing guitar at a wedding, giving a guest lecture at U.C. Berkeley, getting a U.S. Patent (two, actually), getting a teaching credential. I have a few “almosts” as well. I haven’t given a commencement address at a university, but I gave one at a high school. I haven’t ridden an elephant, but I’ve ridden a camel. Recently, I got a “close enough.” One of the items on my list is to perform standup comedy in front of a live audience. Last week, I was master of ceremonies for a comedy show raising money for a local veterans’ center. As emcee, I performed a bit between comedians. I’m crossing that one off. In a few months, I will be achieving one of the most exciting “almosts” of my life. Giving a TED talk is on my bucket list. I will be giving a TEDx talk in March. What the heck is a TED talk? TED started out almost 30 years ago in 1984 as a conference bringing together people to talk about Technology, Entertainment, and Design. The current format for TED talks coalesced in 2006, when the first six talks were presented. Between their website and other venues like podcasts and YouTube, TED is on the cusp of its one billionth view. TED’s current tagline is “Ideas Worth Spreading,” and it lives up to that promise very well. These five videos represent things that appeal to me. They carry themes that represent big parts of my life: books, storytelling, public speaking, science, nature, technology. There are thousands more. Scan through the available TED talks and you’ll find subjects that appeal to you. I can almost guarantee it. Look through the list of presenters, and you’ll find an impressive roster of recognizable names: Malcolm Gladwell, Arianna Huffington, Bill Gates, Doris Kearns Goodwin, Peter Gabriel, Tim Berners-Lee, Vint Cerf, Temple Grandin, David Pogue, Annie Lennox, Adam Savage, Thomas Dolby, Jeff Bezos, Tony Robbins, Al Gore, Bono. Some of these people have changed the world! Can you see why my bucket list would include walking out on the stage where they’ve spoken? Last month, I went to work and found a message waiting for me from a gentleman named Ken Fichtler. He is a co-founder of TEDxBozeman, and dropped in to ask if I’d submit a proposal for a TEDx talk. Let me back up for a moment and explain TEDx. TED is all about ideas worth spreading. There are far more of those ideas than can possibly be covered in the main TED events. The TED people decided that they needed to give more people an opportunity to participate, so they created TEDx, where the “x” means “Independently Organized TED Event.” On March 23, 2009, the first TEDx event was held at the University of Southern California. Since then, there have been over than 5,000 TEDx events in 148 countries and 50 languages! If you visit the TED website, their catalog of 1,500 TED talk videos is augmented by an astonishing 30,000 TEDx videos from conferences around the world. And Ken Fichtler was inviting me to participate. Well, to apply to participate. I contacted him and asked if there was something in particular that led him to approach me. Was it my poop books? My work with tea? My recent talks about censorship and book banning? As it turns out, he was familiar with my work in closed captioning for deaf and hard-of-hearing people, and that’s what he had in mind. Being the cheeky fellow that I am, I went ahead and submitted two applications. One was what I’ve been speaking about lately, and I entitled it “Does Book Banning Work?” The other, more along the lines of what he was looking for, I titled “Does Closed Captioning Still Serve Deaf People?” I sent in the applications, and I waited. For three interminably long weeks, I waited. Three days ago, I got word that the committee had met and made a selection. It has been confirmed. They picked the captioning application. 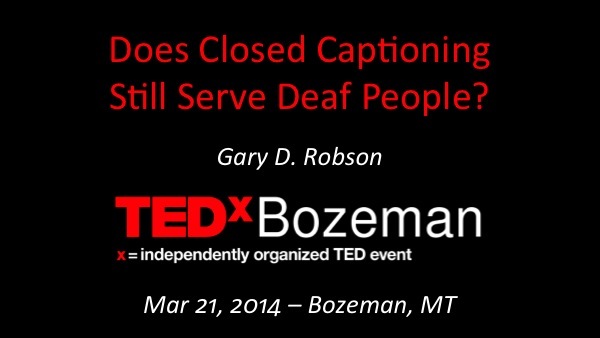 I will be presenting a talk at TEDxBozeman on Friday, March 21, 2014. I am hyped. I am thrilled. I am humbled. I’ve spoken to some pretty big audiences before — 650 people is my current record — but this will be the highest-profile talk I’ve ever given. Soon, I’ll post some more about my talk, although I’m not going to give away any details. You’re going to have to either attend TEDxBozeman or catch the video online if you want the whole story.